"A single success can atone and more than atone for all the failures in the world." A legendary, maligned teacher whose reputation far preceded his presence is a staple in any educational experience. We've all known at least one individual whose very name struck terror into the small hearts of eager youngsters. Much to the chagrin of such a professor, the eager attitudes of his pupils are frequently directed towards non-scholarly pursuits, such as formulating insulting, complex impersonations over the lunch hour. While caught up in the wonderful, but sometimes mischievous thoughts of youth, such a person frequently goes misunderstood. Mr. Crocker-Harris knows this all too well. In the twilight of his career teaching the "soul-destroying" lower fifth at a private boys' school, Andrew Crocker-Harris (Michael Redgrave) is looking back. It has been a less than satisfying stint; his students despise his stoic, soulless approach to teaching, and Crocker-Harris is convinced his efforts to pass on his passion for Latin, Greek, and mythology have miserably failed. Dubbed "Crock" by his pupils, and "Himmler" by his own Headmaster, Andrew's passions have been buried by his less than affable demeanor. During his last class session, the muffled laughter emanating from Mr. Hunter's (Nigel Patrick) popular science class is the final nail in the coffin. There is no going back. True, there are a few teachers whose bitter behavior lacks any redeeming quality, but most begin their careers with a firm desire to impart knowledge. Crocker-Harris is certainly one of these, but even his wife, Milli (Jean Kent), who has grown distant over the many years of correcting Latin passages, despises the ailing man. She is moving headlong into adultery and speaks to her husband with a venomous tongue. The two have ceased loving one another. Before the pit of depression swallows this poor man whole, Taplow (Brian Smith), a young student, shows a glimmer of interest in literature. Agamemnon is the choice work (the Browning translation, to be exact), and Taplow's manners begin to break through Crocker-Harris' stoicism—changing one young life may be just enough fuel for redemption. Adapted from Terence Rattigan's one act play, The Browning Version is a filmed stage production through and through. Shot in a decidedly stuffy, claustrophobic British manner, director Anthony Asquith's approach serves the material wonderfully. One of Britain's finest directors, Asquith's style is appropriately transparent, allowing the marvelous performances to shine through. The challenge of the material is found in the desire to make Mr. Crocker-Harris likeable within the first few minutes. This is a formidable task, no doubt, but we are quickly convinced this is a misunderstood man to be pitied; nevertheless, Andrew's personal contributions to his plight are not forgotten. It is a heartbreaking tale in many ways, culminating in a cathartic speech that airs demons, and grants Crocker-Harris some measure of peace. Michael Redgrave is simply riveting here; not an easy feat when one is playing a passionate man buried in stoicism. This is the performance of his career, layered with a sense of history, and plain fatigue. Crocker-Harris is a man on the edge personally, professionally and physically, and Redgrave's account of this man's decay is riveting. Supporting characters are also noteworthy: Jean Kent is chilling as Andrew's distant wife; Nigel Patrick's turn as Mr. Hunter strikes the right emotional complexity; Brian Smith is bright eyed as Taplow; even some comedy slips in, thanks to the charisma of Wilfred Hyde White's Headmaster. The Browning Version bowled me over with its understated tension, drama, and avoidance of sappy sentimentality. I'm forced to reconsider some professors from years past. There have been times when I have been a Taplow, but like any student who grows tired, I have occasionally failed to understand the humanity beneath the technique�a mistake I hope not to repeat. Image Transfer Review: The black-and-white 1.33:1 transfer is excellent. Contrast is solid, and detail is good. The print is relatively clean, but fine grain and some haziness persists early on. This remains a luminous restoration that will certainly please the most discerning viewer. Audio Transfer Review: The audio can sound a bit muffled, but dialogue is readily audible, and hiss is minimal. Extras Review: We begin with an audio commentary by film historian Bruce Eder. Eder's contributions are steeped in detail, and his tone is conversational, yet prepared. Topics include the director, playwright, casting, art direction, and more. A new interview with Mike Figgis (19m:54s), director of the 1994 remake with Albert Finney, reflects my personal reaction to the film. He tells the tale of how he stumbled on this picture, and how it's one of Ridley Scott's favorites. He also examines the work's historical context. You will also find an archival interview with Michael Redgrave from 1958 (05m:46s). This brief television interview covers Redgrave's approach to acting, and touches on his work in The Browning Version. Finally, an insert contains a new essay by critic Geoffrey Macnab. Anthony Asquith's adapation of Terence Rattigan's one act play recalls the glory days of British cinema. This is a superb adaptation steeped in tension, drama, and poignant messages. 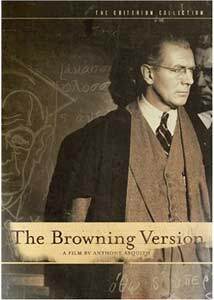 Michael Redgrave's performance is simply outstanding. Criterion's careful presentation makes the experience all the more pleasant.